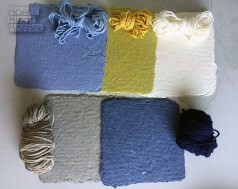 Here are the newest projects. 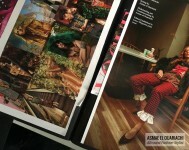 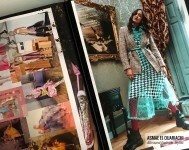 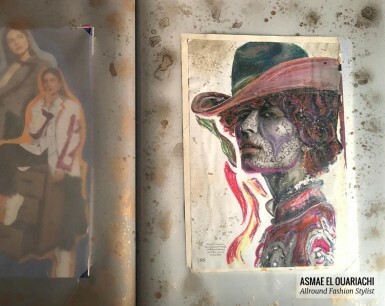 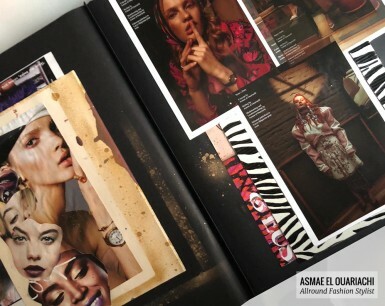 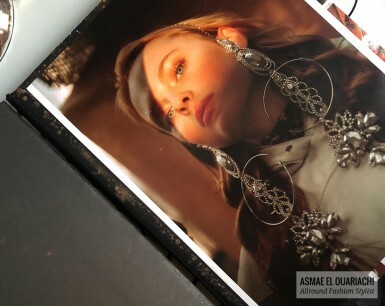 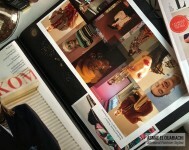 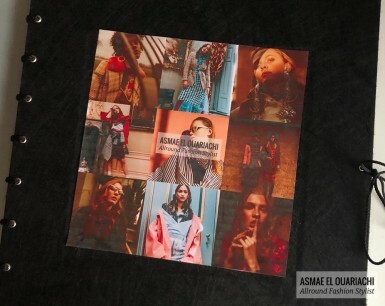 A portfolio album, custom ordered by Asmae el Ouariachi, an Allround Fashion Stylist. 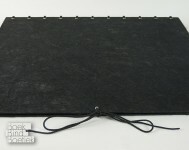 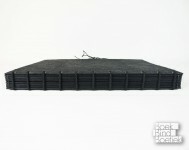 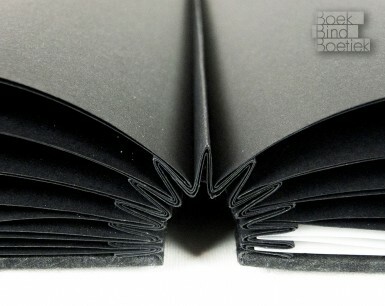 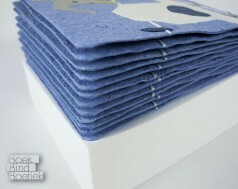 It is an A3+ book, with a concertina/harmonica back, bound on 11 cords that disappear into the covers. 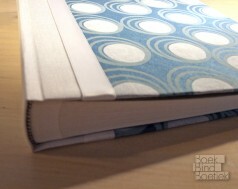 The front cover has a lowered square surface to accommodate an image. 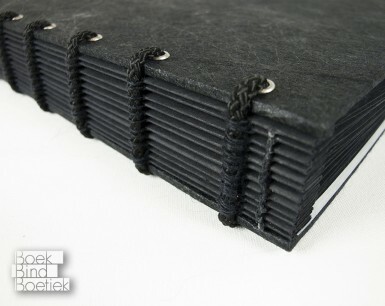 I added a thinner cord to close the book. 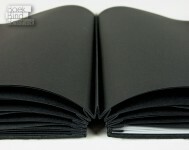 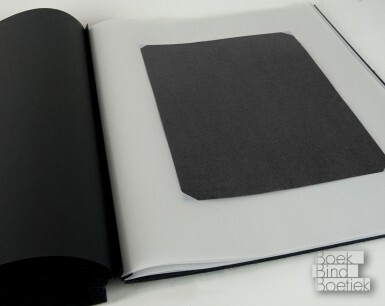 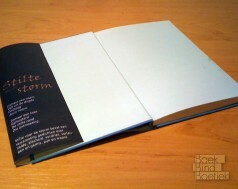 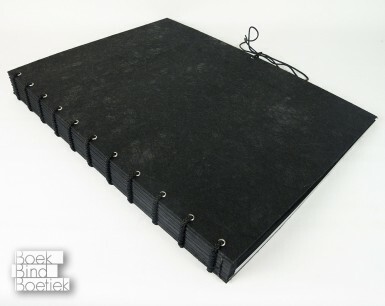 The book has 20 black pages (40 sides) and 4 semi-transparent pages for double sided sketches. 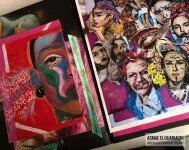 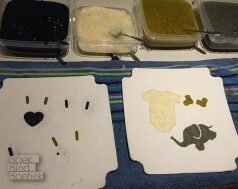 After receiving the book, Asmae filled it, personalized it and sent me some pictures. 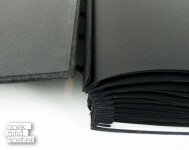 I’ve attached those to this post. 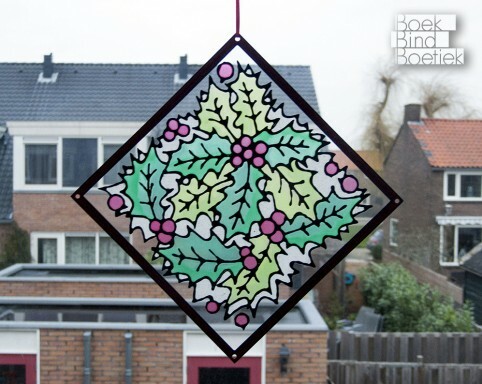 For my 2018 Holiday Cards I decided to use a technique I’d used that summer with the kids in my creative wednesday workshops: Faux Stained Glass. 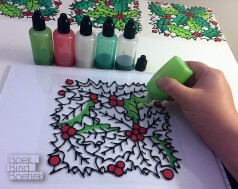 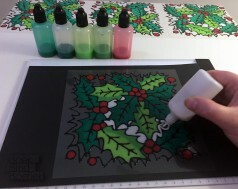 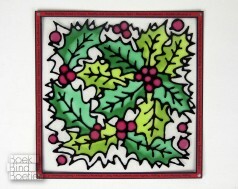 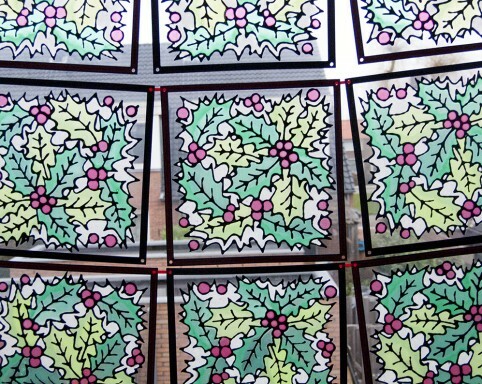 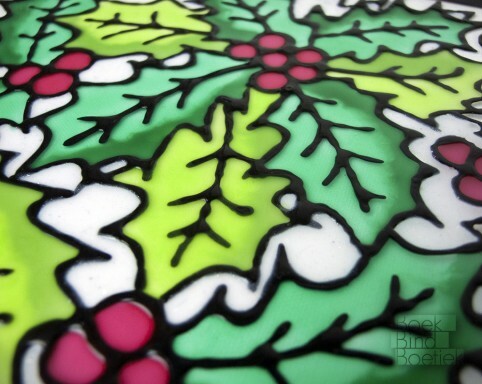 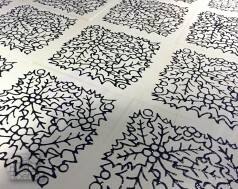 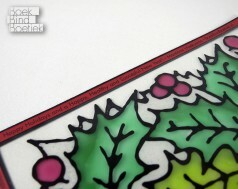 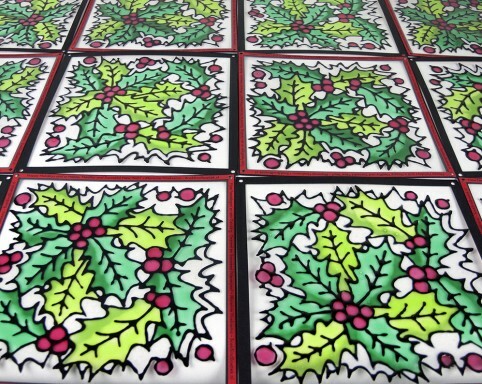 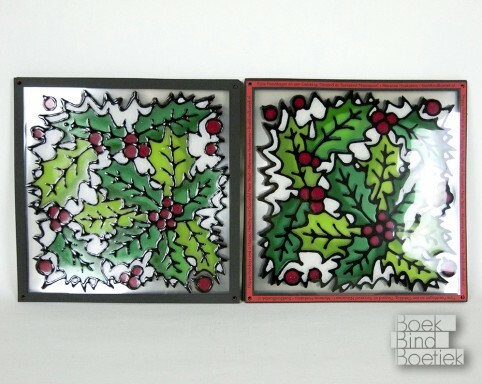 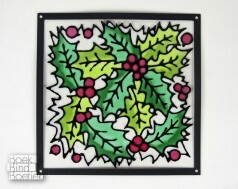 I created 25 cards with plastic overhead sheets, drawing and coloring in the holly leaves and berry’s by hand. 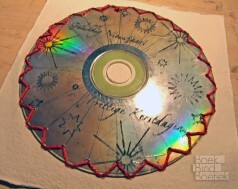 Around the edges are holiday wishes in two languages. The cards were delivered with lengths of red ribbon so that the cards could be hung in front of the receivers windows. 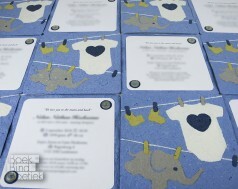 I’ve become an aunt again, and – the same as last time – I made the birth announcement cards. 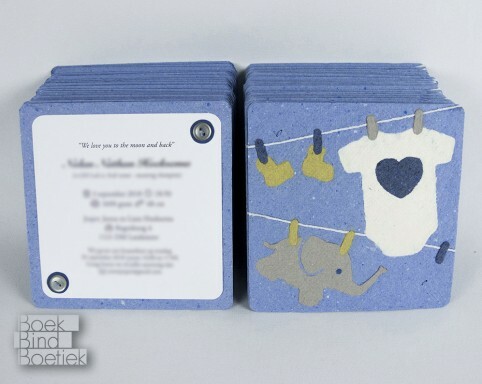 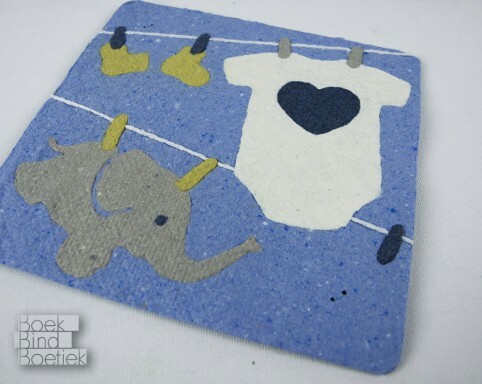 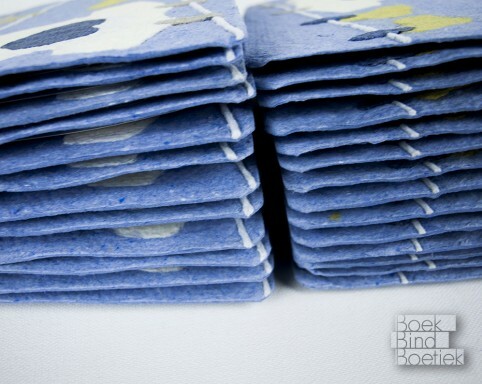 They are 60 cards from handmade paper, with baby clothes on a washing line and – a special request from my other nephew – a ‘pluche’ elephant. 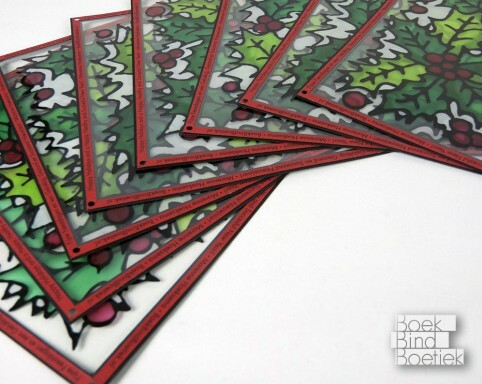 The cards are about 65 percent recycled milk cartons. 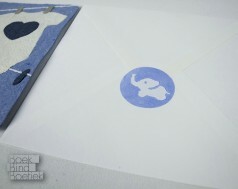 Both the paper on the back and the envelopes are made from Biotop paper. 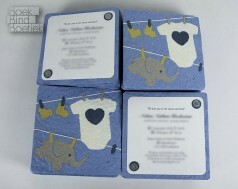 The information card on the back is fastened to the front with two buttons. 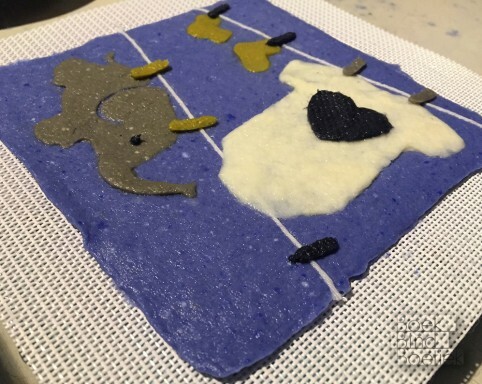 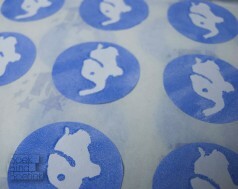 The sticker seals were created with a homemade stamp and acrylic paint. 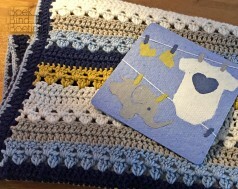 I took the colors I used from the baby blanket Nolan’s mother made for him.